I've got to say that track construction and laying is far from the top of my preferences. However, without trackwork it wouldn't really be a model railway, would it? So, I persevere! Having almost completed the pointwork on board No.2, I turn my attention to spanning the joins between the two boards. You will remember that Edward helped me construct some very accurate boards using what was effectively a kit of pieces from Alan Smith. The quality of these, especially the joins, has proved invaluable. Each time I join up two boards, they come to exactly the same position. Now, having purchased some milled sleepering for baseboard joins, I proceed. A piece of Easitrac was made up, but with a ten sleeper gap in the middle. The milled sleepers were PVA'd across a board join and allowed to thoroughly dry. I then placed the Easitrac over this join and glued that in alignment with the track on each board. Once the Easitrac PVA had set, I inserted individual chair etches (Fencehouses) between milled sleepers and rail and soldered them solid. 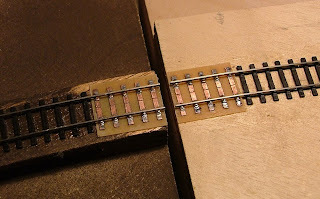 Looks very neat Tony, as I will be using Esitrack for my main layout, I shall probably do the same at the baseboard joints. It’s helpful having accurate baseboard ends; Alan is a useful guy to know. He has built me a travel box for Marks Quay, much better than my own effort. Hopefully I will get back to blog posting next week as I have made some progress over the summer.